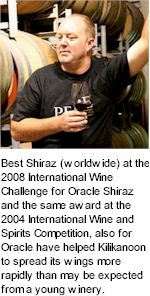 Valley Clare produces some of the most highly sought Shiraz wines in the world. Just like the French, Kilikanoon make a second tier wine from the same vineyards as the estate flagship Oracle. The best parcels of Clare Valley fruit, from vines up to forty years of age, are selected and assembled to create the terroir based Covenant Shiraz. Intensely varietal with lifted aromas of black olives, a wine of extraordinary power and finesse, as spiced plums and splendid French oak see the fruit through to the stylish, evenly textured finish, seamless and long. Kilikanoon's proprietor Kevin Mitchell is a seasoned veteran of the wine industry, starting out as cellar hand and assistant winemaker with Krondorf, d' Arenberg, Kingston Estate, Orlando, BRL Hardy, Kendal Jackson and Willamette Valley in the US. Covenant Shiraz is treated to a traditional handling, fermentation takes place in small open vats followed by a gentle pass through a basket press. Hand picked Shiraz grapes are selected from six vineyards throughout the Leasingham Valley, each is fermented separately, basket pressed and aged eighteen months in a selection of small French oak casks. Bright red colour with youthful crimson hues. Intensely focused bouquet, expressive of dark fruits, licorice, wild olives and quality French oak spice. Richly apportioned with layers of complexity, fruit weight and flavour persistence, the palate combines dark fruits, cooking spices and chocolate notes, beautifully supported, classy French oak flatters and integrates, providing seamless length and flavour persistence.